Personna is a brand that has 125 years of passion, experience and innovation behind it, and this has helped it become one of the most reputable manufacturers of razor blades in the salon industry. 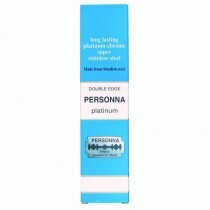 Perfect for leaving your clients with a smooth and comfortable shave without breaking the bank, Personna razor blades are really becoming a firm favourite in the UK. Salons Direct are your one stop shop for all salon supplies, so place your order today for great prices and a flexible, reliable delivery service.